Sometimes part of the fun in going on vacation is planning what you’re going to see, and subsequently drooling as you dream about getting away from work for just… a little… bit. I recently went on quite the roadtrip — Toronto to Vancouver Island and back via the USA. A lot of the cool places we saw were thanks to diligent planning and knowing where those spots would be. How did I find them? You might be surprised, but I used Instagram and Pinterest to find cool spots and hidden gems along the way, and around our final destination as well. Today I’m gonna show you how you can do the same for your own trip. When we were mapping our route to the Oregon Coast, I saw we’d be passing through a town in Oregon called Bend. So I’m gonna use that as an example. First, go to the Explore page by tapping the magnifying glass at the bottom. Once there, tap the search bar at the top. Here we have a map, and the most popular pictures taken in Bend, OR. Let’s scroll down a little until we find something that catches our eye. Hey, that waterfall in the middle looks really cool! Let’s tap on that picture. Upon further inspection we can confirm this waterfall is, in fact, really cool. We wanna check it out a little more. Look up in the top left corner. Looks like @chrisurizar tagged the location. Thanks Chris, you’re a real champ! Tumalo Falls. Just tap on that. It’s as easy as that! Now that you know where it is, you can get directions to it from Bend or wherever your nearby accommodations are, and you can add it to your itinerary. I’d like to introduce you to my irrevocable man-card. ‘Sup. Give Pinterest a chance. Yes, it’s mostly used for decorating and recipes, but even for guys there are a lot of practical uses. One, which is good for Jack or Jill, is finding hidden travel gems. 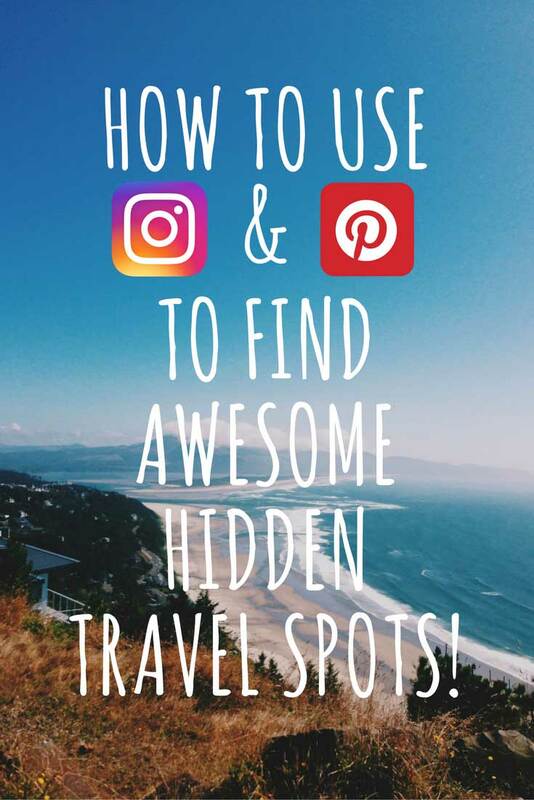 Looking for spots on Pinterest is just as easy as Instagram, and has a couple of nice features that may give it an edge over IG. Once you have Pinterest open, tap the magnifying glass icon on the bottom toolbar. Then tap the search bar at the top and search for your location. Let’s use Bend again as an example. Here we have the first cool feature of Pinterest on display. Notice the area I highlighted in red, underneath the search bar? You can slide that to the left or right and select those options to narrow down your search further. Everything from “Things to Do”, what to do in “Winter in Bend”, where to go “Mountain Biking”, and there’s a lot more. It makes it very easy to find what you’re looking for. Now, looking at the search results, we see Tumalo Falls in the middle again, but this time it’s a list of things to do there. There’s a Bend travel guide in the top left, that’s cool too. But something is drawing my eye to the bottom right… Can’t put my finger on it. Oh yeah, BEER. By clicking on the enlarged picture again, it takes me to the source of this Pin, an article on Everyday Runaway that lays out the best breweries in Bend and which beers I should try. This is an awesome list, and I don’t wanna forget about it. No problem, we have a few options from here. In the top left corner there are 3 buttons. ❤ The heart will “like” the Pin, and it will appear on the list of Pins I’ve liked. It’s ok, but I wanna narrow it down a bit more. ➢ The paper airplane will allow me to send it to friends of mine on Pinterest, email it, or send it to others through my devices messaging app. You can pick any one of your created boards or make a new one. I’ve already started a Bend board so I’m gonna just tap on that one to save it there. This is one feature that in my opinion sets it above Instagram. Not only does it connect you with more information about the travel spot you found, but you have the ability to save it for future use. Instagram and Pinterest helped us to plan our trip and make it even more memorable. I’m planning a trip to the Outer Banks in North Carolina for the springtime, and I guarantee you I’ll be using these apps again. Give it a try for your next trip!